Ocala, FL | Financial Advisor — Estate and Retirement Resources, Inc. 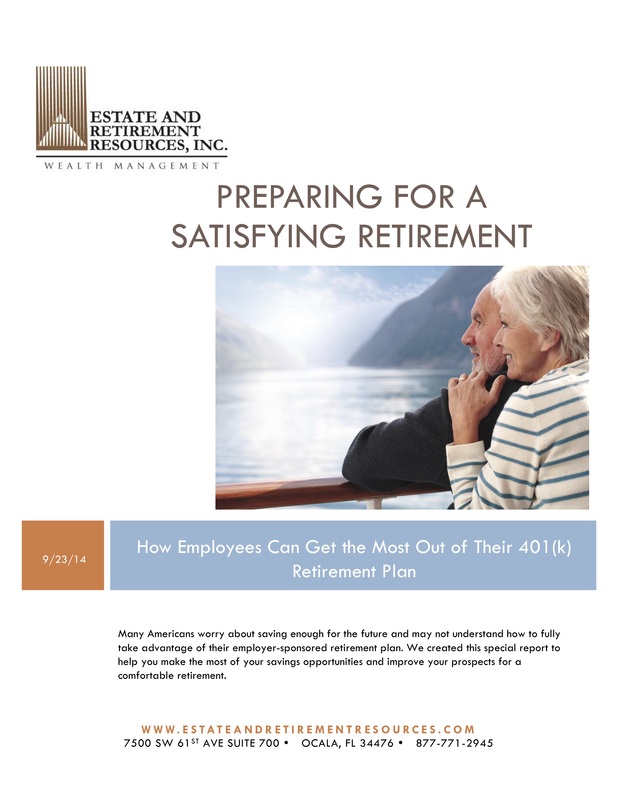 There are few steps in life that are filled with more emotion than preparing for retirement. From excitement over your retirement plans to concern about your financial security and leaving the right legacy, most people face this new stage with a mix of apprehension and enthusiasm. At Estate and Retirement Resources, Inc., we understand that retirees face many important decisions that can affect their long-term financial success. Some of these decisions revolve around making investments that will help create a hedge against outliving their income, the impact of inflation, taxation, and rising healthcare costs. Because over ninety percent of our clients are retirees with similar concerns, we are in an advantageous position to approach such challenges with experience and skill. We work with clients who have enjoyed successful careers and desire a comfortable retirement lifestyle for themselves and their families. We also work with clients who are in need of a new advisor due to relocation or a lack of peace of mind with their current service.